It’s amazing what people can do with commercially off the shelf components. 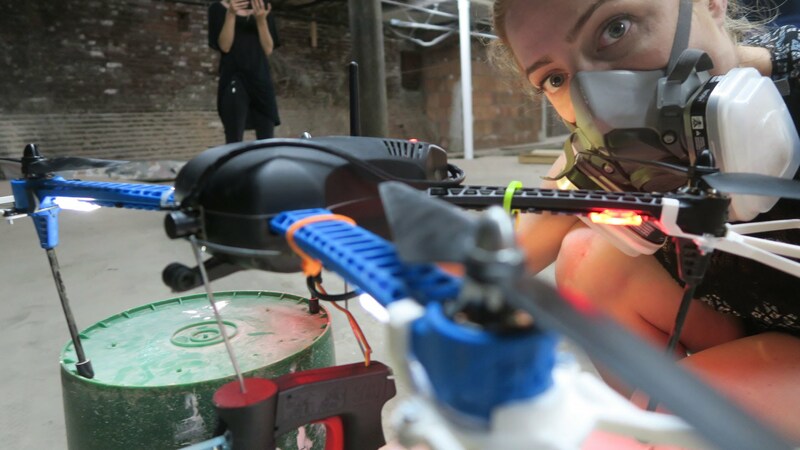 Wagenknecht, Moore, and Stern, a group from the all-female collective Deep Lab have been experimenting with different techniques for distributing the paint with a drone and drone art in general. This guide follows an attempt to make a spray painting quadcopter for indoor drone painting. Use this guide on your own property only! We do not endorse the use of this technology for any illegal painting. This guide was developed with support from NEWINC, Deep Lab, and 3D Robotics, and through collaboration with Dan Moore and KATSU. Similar to Adafrust, Drone Universities provides the above links for educational purposes only. We do not endorse the use of this technology for any illegal painting. Use at your own risk. This is not graffiti 2.0.